I swore never to open another restaurant in my life,” states Nicole Precoudis emphatically. She’s showing us around her vegetable garden. Artichoke plants cut royal silhouettes among the spinach, chives, red lights and chillies. She didn’t open a restaurant, not really. 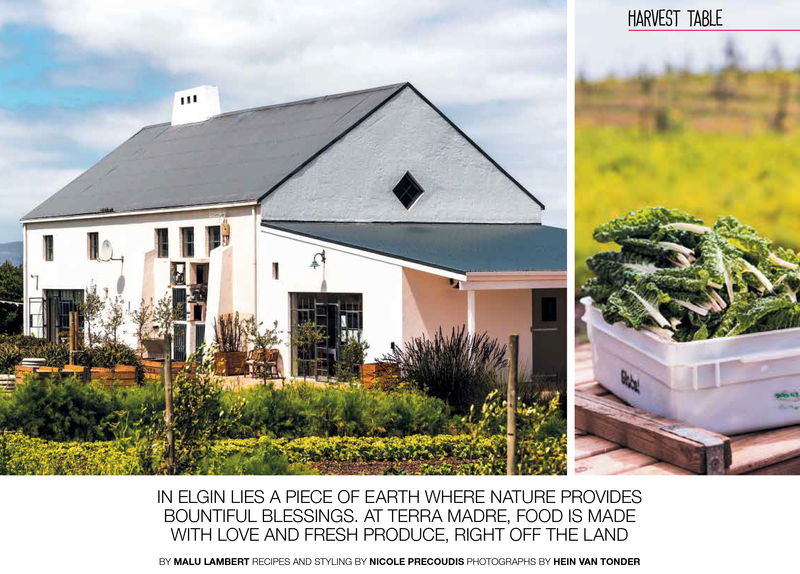 Terra Madre in the Elgin Valley, an hour or so out of Cape Town, is predominantly a working apple farm complemented by vegetable gardens and olive trees. The farm’s produce is used in Nicole’s Food Barn deli (and store), which is open on certain days of the week as a casual eatery (it’s also available for functions). “Guests can pick their own veg,” she enthuses as we leave the garden. The Food Barn concept was introduced to support the Terra Madre online store (terramadre.co.za), which offers an abundance of handmade products, from pâtés and dips (the taramasalata is delicious) to charcuterie, organic veg, pickles, jams – just about anything you’d nd in a true food lover’s kitchen. When in apple country, drink fresh- pressed cloudy apple juice. That’s just what we do in the morning sunshine as Nicole explains her non-restaurant. The lunches on offer are casual and simple. Guests can choose from tables set up inside the Food Barn, on the stoep surrounding the barn, which overlooks the vegetable garden and olive grove or tables arranged in the apple orchards. “Our visitors can select whatever they want from the deli to make up their lunch and go and eat it in whichever area they prefer,” explains Nicole. “We also have an apple-wood re, over which we grill meats; the wood imparts a wonderful avour. It’s simple, honest food. I call it village food. It’s all about a long, languid lunch, with good food, wine and, of course, great company.” She goes on to say that all the tables receive complimentary spring water from the Elgin Valley, and that the “freshly pressed, single varietal apple and pear juices ow”. Nicole also makes a cider. But this is no ordinary craft cider. The Terra Madre Pommes Classique is a bottle-fermented vintage (2009) cider made in the same method as Champagne. It comes in a Champagne-style bottle, and has an apple twig tied around its neck for good measure. Today she’s hosting a function – and cooking for us on top of it. We follow her into the kitchen. “Here, taste this,” she says, offering me a spoon loaded with glossy lentils. Her parents, who live with her on the farm, are a key part of this family-run business. In fact, her mom is in the kitchen with us making Greek salads for the function. “I love this woman with every ounce of my being,” smiles Nicole, going over and squeezing her in a hug. Nicole is as generous as the bounty on her farm is. Effusive, affectionate and full of jokes, you quickly feel at home at Terra Madre – and that’s kind of the point. “I want people to feel like guests in our home, with the hope that they’ll walk away having made special memories.” It’s a philosophy she extends to the people she works with too. The farmers and gardeners who work on Terra Madre also help her in the kitchen and with restaurant service. With her jet black hair pulled back tightly in a ponytail, she stirs bubbling pots, while plating our dishes. We kick off with a Cretan pie packed with Swiss chard, fennel, haloumi, feta and herbs. Then it’s on to the loukaniko, which is a traditional Cypriot sausage made with acorn-fed pork that has been marinated in red wine. “The sausage has been soaking in wine for days,” she explains, showing us the link of loukaniko sausages. is what makes the sausage special. Schinia is a spice indigenous to the Mediterranean and it’s used only in loukaniko – its sole purpose in life.” The sausages are then grilled over an apple- wood re and served as part of meze. For dessert, she’s preparing spiced Elgin Granny Smith apple tarts with fresh strawberries, vanilla-yoghurt ice cream and a kiwifruit coulis (the kiwi is also grown in Elgin). Nicole adds that, generally, the meze range – spanakopita, charcuterie, pâtés and apple juice – are some of the most popular products. With the function over, Nicole literally lets her hair down and we wander into the apple orchard to enjoy a glass of the vintage cider. I like it too; it’s without a doubt the best non-restaurant I’ve been to.